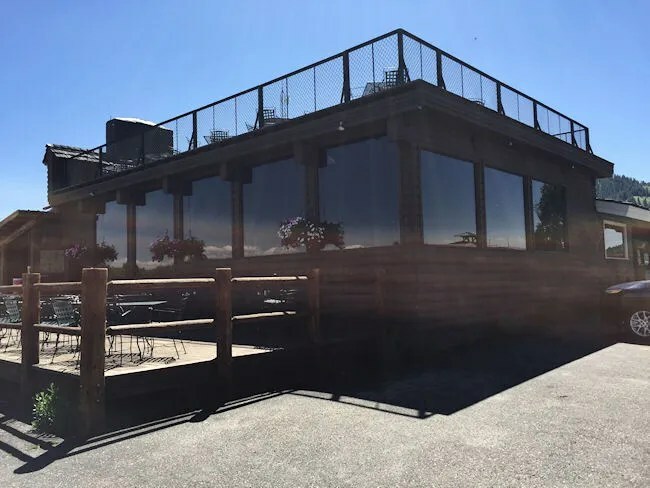 For many, many years now, I have heard about this restaurant with an amazing view of the Grand Tetons from both my wife and her parents. J has always wanted to take me out west and if we ever did, we absolutely were going to stop for a meal at one of her favorite restaurants. Dornan’s is an old family homestead in the unincorporated town of Moose, WY. 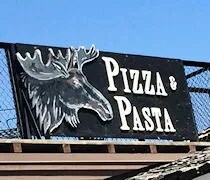 Up until recently, they WERE Moose, WY, but there has been some new additions to the town near the entrance to the National Park. The Dornan’s property is sort of a rustic resort. They have cabins available for camping, a chuckwagon for meals during the summer months, a restaurant overlooking the Tetons, a general store, wine shop, bike, canoe, and kayak rentals and more that I’m probably forgetting. We slept in the day we staying in Jackson and decided to hit Dornan’s for lunch. This was a must-stop on our trip. J didn’t care about anyplace else that we ate at as long as we had at least one meal at Dornan’s. We decided to skip the breakfast at the Chuckwagon and wait for the Pizza Pasta Company to open. 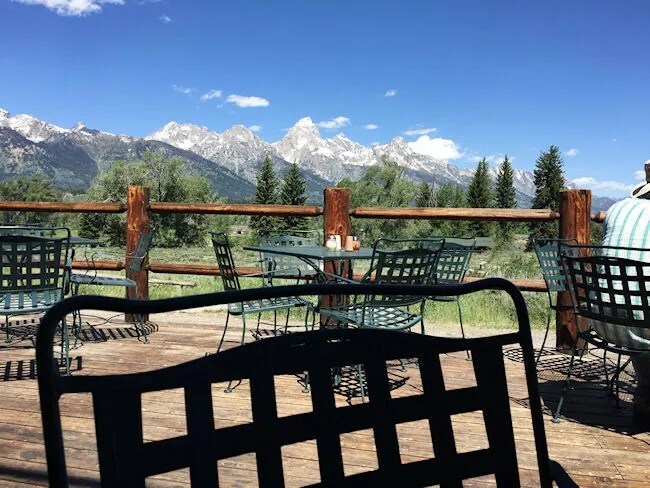 The restaurant is on the north end of the property with a gorgeous view of the Tetons. There are two patios plus a large dining room with picture windows so there’s a view almost anywhere you sit. The Pizza Pasta Company opens for lunch at 11:30. We showed up a little bit early and just walked down to the Snake River for some picturesque waiting. Once it got closer to opening time, we walked back and in to the restaurant. It looks like a place that would have table service, but, at least for lunch, ordering was done at a cash register near the kitchen. They then asked where you were planning on sitting and gave you a number to put on the table. The menu at the Pizza Pasta Company is pretty self explanatory. It’s mostly pizza and pasta. There are a couple of sandwiches and they do calzones, but for the most part, it’s pizza and pasta. I kept things simpled and just ordered the lasagna. J went for another pizza after an amazing one the night before at Snake River Brewing. She did the Static Peak. We both added on drinks at the cash register instead of going to the bar. It was early and I had already drank a lot on this vacation. I let J decide where to sit and she make a beeline for the patio. Why did she choose the patio? This is the view. We found a spot in the shade so we weren’t baking in the sun, but it was imperative that we sit outside and try not to be distracted by that gorgeousness while we ate. Not long after sitting down, the guy that took our order came out with drinks followed by another server who had our food. 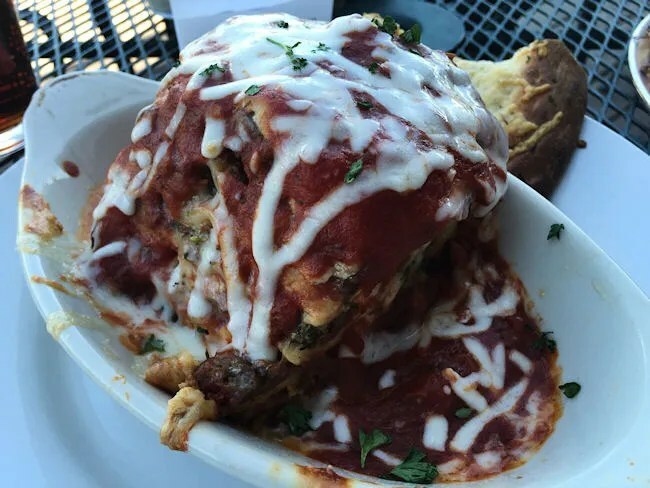 I wasn’t really hungry yet, but I was going to have to get hungry in a hurry once I saw the slice of lasagna that was set down in front of me. This huge slice of pasta was layered with sauce, cheese, noodles, sausage, and broccoli. The broccoli thing threw me at first and I didn’t really like that it was big slices of the veggie, so I took most of it out leaving just the smaller parts of the floret. The lasagna would have been amazingly good without the broccoli, but was still pretty good with it. Just had to do some picking to get to the parts I really liked. J’s pizza was another delicious looking creation. All of the pizzas are named after peaks of the mountains. The one she chose was called Static Peak. 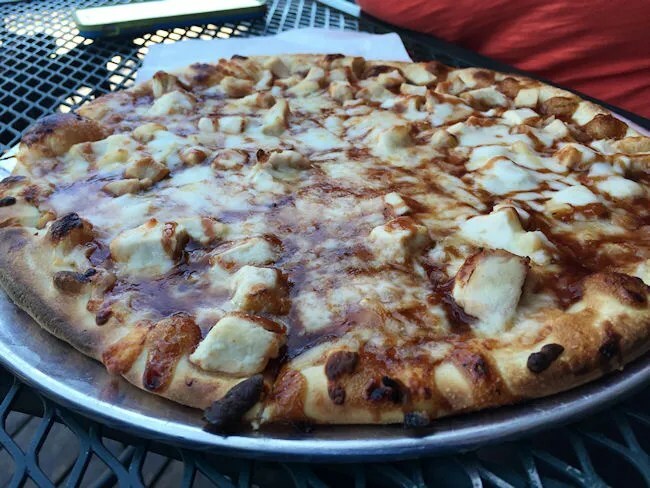 It was topped with BBQ sauce, chicken, red onion (left off), and gouda. She was still riding a high from the pizza from the night before so this one was a little bit of a let down. Not because it wasn’t delicious…it still was…but just because the Chorizo Peach Pizza was still lingering on her brain. Our bill for lunch at Dornan’s came out to right around $40. It sounds a little high for not having drinks, but, like most Italian restaurants, the portions are much larger than expected. J is so happy she finally got to show me Dornan’s and I am so happy to finally understand what she and her mom are talking about when they talk about the place. Dornan’s is a must stop for traveler’s making their way through Grand Teton National Park. The food is good and the views are amazing.